The STR250 Laser Raman Spectrometer is a highly compact, and flexible system with a high sensitivity to measure an weak Raman scattering from different materials.The system consists of an imaging spectrometer and TE cooled CCD camera. We offer a remote probe head for remote sampling, a optical microscope for small sample with spatial resolution < 1mm, and dual excitation lasers for visible and Near IR region. Near IR laser will resolve the florescence problem from the organic compound. The system include user friendly Windows based control and data processing software. 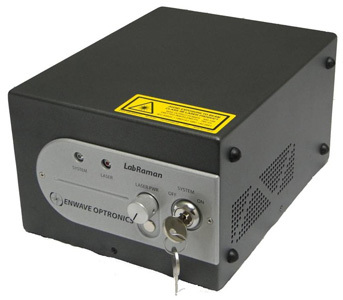 The ProRaman-L Series are high-performance laboratory Raman instruments suitable for industrial applications or labora-tory experiments requiring an affordable, high sensitivity Raman instrument. 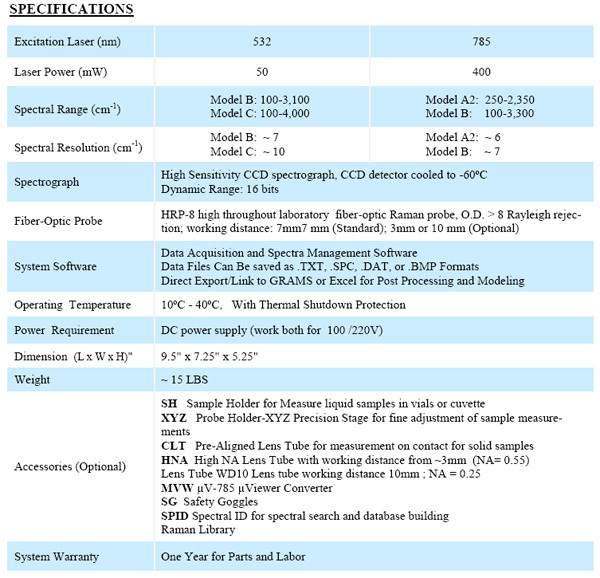 The ProRaman-L features a high sensitivity CCD spectro-graph with CCD cooling temperature to –60ºC, and high through-put laboratory fiber optics probes. Each system includes a note-book computer preloaded with RamanReader software for opera-tion. 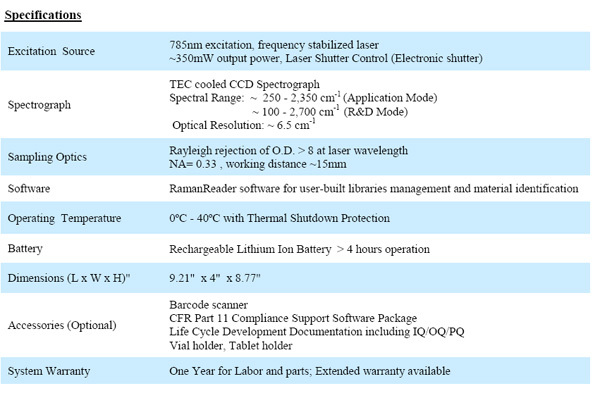 The excitation laser are available at 532nm and 785nm. The ProRaman-L instruments are ideal for demanding Ra-man analysis in academic, research, industrial laboratories and process line requiring an affordable, high performance Raman instrument. The new LabRaman Raman analyzer is a high-performance laboratory Raman instrument suitable for indus-trial applications or laboratory experiments requiring an af-fordable, high sensitivity Raman instrument. 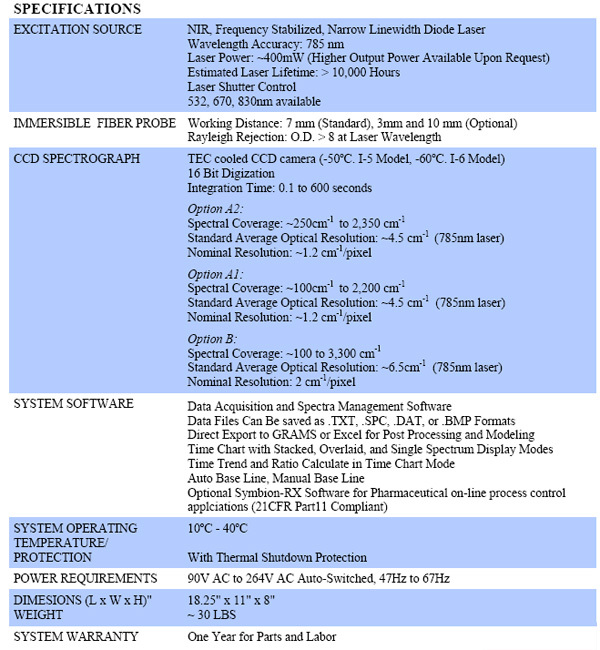 Each system in the LabRaman instrument features a 785nm frequency stabilized laser, a high sensitivity spectro-graph with cooled CCD to –45ºC, and a high throughput la-boratory fiber optic probe. Each system achieves ~6cm-1 aver-age optical resolution with spectral coverage available from ~250—2,350 cm-1 and ~100—3,300 cm-1 for 785nm; and ~100—3,000 cm-1 and ~100—4,000 cm-1 for 532nm. 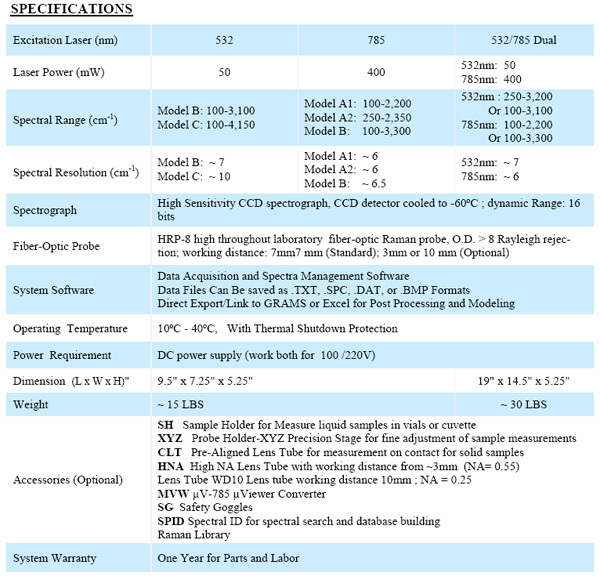 The LabRaman instrument is ideal for demanding labora-tory Raman identification, chemical process monitoring in the lab, and for any academic, research, industrial laboratories requiring an affordable, high performance Raman instrument. The new ProRaman-I Series are industrial process Raman instruments suitable for industrial applications or laboratory experiments requiring an affordable, high sensitivity Raman instrument. 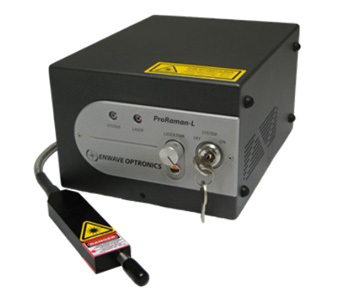 The ProRaman-I systems each feature a 785nm frequency stabilized laser, a high sensitivity CCD spectrograph with CCD cooled to either –50ºC or –60ºC, and a high throughput immersible fiber optic probe. The system achieves ~4.5cm-1 averaged optical resolution with spectral coverage options from ~250 to 2,350 cm-1 or ~100 to 3,300 cm-1. ProRaman-I systems are ideal for on-line process monitoring and for any academic, research, pharmaceutical, industrial laboratories requiring an affordable, high performance Raman system. 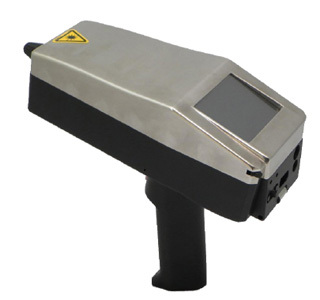 The EZRaman-H is a high performance handheld Raman ana-lyzer for rapid material identification and verification in a cGMP environment. Applicable uses include raw materials identity verifi-cation, inspection of intermediate and final products, process trou-bleshooting, and counterfeit detection. The analyzer is easy to use. 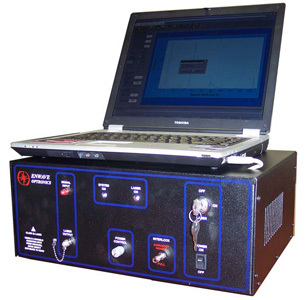 The non-invasive point-and-shoot sampling facilitates rapid verification of a broad range of chemical compounds. The Analyzer is designed to meet the requirements of current good manufacturing practices (cGMP) and 21 CFR Part 11-compliant environments with full IQ/OQ/PQ documentation. The EZRaman-H is a rugged, and powerful handheld Raman analyzer. It is an ideal choice for pharmaceutical, industrial chemi-cals, and other applications requiring a high performance and af-fordable handheld Raman analyzer.